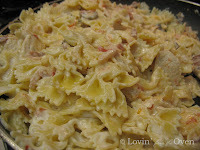 Frieda Loves Bread: Asiago Cream Sauce Chicken Bowtie Party! 3 Asiago Cream Sauce Chicken Bowtie Party! 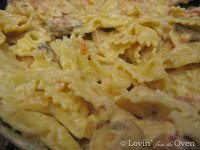 I fell in love with bow tie pasta ever since I had Farfalle at Tucci's, a restaurant that closed last summer. It was simple...had mushrooms, spinach and pine nuts in a glorious lemon/alfredo cream sauce. I was really sad to see it go, but happy to see the Bowtie Festival dish at Johnny Carrinos. You can cook your chicken any way you want it...I cooked mine covered for 6 minutes in the microwave and then sliced them thinly. Try grilling it. Also try cutting a semi-frozen chicken breast into thin slices and cooking them in with the bacon, onions, mushrooms and tomatoes. I freeze my bacon and cut it across with kitchen shears to make thin slices. Then I cook it. It's much easier than cooking and crumbling the bacon. Bring a large pot of water to boil. Cook pasta for 12 minutes. Drain and set aside. Heat 2 T. vegetable oil in a skillet and cook chicken cubes over medium-high heat until meat is not pink. Set aside. In a medium saucepan, bring 2 c. half and half to a simmer, stirring often. Stir in chicken base and cheese until well blended. Dissolve cornstarch in a little bit of water and whisk into the cheese mixture. Cook until thick and bubbly; set aside. Melt butter (or cook bacon and use its grease instead) in a skillet over medium heat. Stir in prosciutto, onion, mushrooms and tomatoes and cook until veggies are tender. Add garlic and cook for a minute or two. Add cream sauce mixture to sauteed vegetables and bacon (or prosciutto). Add chicken cubes or slices. Add pasta and stir well till pasta is coated. Serves 8 people...you will have a lot of leftovers! The shape of this pasta looks so cute and the recipe looks delicious as well. This is really delicious! I love bowtie pasta!